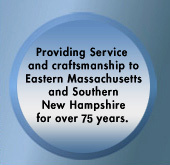 At Embree Elevator, we have been serving customers in Eastern Massachusetts and Southern New Hampshire for over 75 years. Our fully licensed and insured technicians are available on a 24 hour 7 day per week basis, so help is always just a phone call away. From maintenance programs to safety testing to system modernization, Embree Elevator pledges to meet all your elevator needs. Our trained professionals average over 20 years experience in the service and repair of elevator systems. At Embree Elevator our fleet of service vehicles are positioned throughout Eastern Massachusetts and Southern New Hampshire so a technician is never more than a short distance away from your elevator. At Embree Elevator we believe an elevator system is only as good as the service that backs it up. We offer flexible maintenance programs designed to meet each customers unique needs and requirements. We work closely with our customers to understand their elevator needs then commit ourselves to meet or exceed those needs and expectations. We are dedicated to building long term customer relationships through striving to achieve the highest levels of customer satisfaction and through continual focus on improvements in operational excellence.